Tokyo, Japan – March 24, 2016 – LINE Corporation announced an expansion of its LINE Pay services, providing an easy cashless method of completing transactions. The new services include LINE Pay Card, a prepaid card allowing conventional purchases at the register, and LINE Points, a point system that rewards users for using various LINE services. LINE aims to reduce the inconveniences of cash transactions through accessible, free service, in hopes of closing the distance between sellers and customers. LINE hopes to become a leader in the FinTech industry as the world moves increasingly towards cashless modes of sale. The following services were announced at "LINE Conference Tokyo 2016." LINE Pay Corporation, subsidiary of LINE Corporation, allows customers to send and receive money with other LINE users, and offers simple alternatives for making purchases and payments at affiliated vendors and stores. LINE Pay will continue to enhance the convenience of its “smartphone wallet” service for LINE's 68 million users, with more deposit and payment methods, as well as more participating locations. In addition to five major metropolitan banks, LINE Pay is expanding its partnerships with regional banks across Japan as well as with direct banks, aiming to build an environment where users can easily add money to their card anywhere for free. The launch of payment services with each partner will be announced individually. As of March 24, 2016, users with a partnered bank account are now able to automatically have funds deposited from their bank accounts into their LINE Pay accounts when the latter falls below a set threshold via the new auto depositing feature. LINE Pay is expanding both offline and online affiliate locations, with the goal of creating an environment where users can pay for anything through the service. Expanding affiliate online locations range from fashion outlets to digital content providers and home appliance stores. In order to increase the number of e-commerce sites that will accept payments through LINE Pay, partnership agreements have been made with SMBC GMO PAYMENT, Inc. and SoftBank Payment Service Corp. Individual announcements will accompany the start of each partnership. By scanning a LINE Pay barcode from the customer's smartphone screen at the register, participating physical retailers will soon be able to accept payments through LINE Pay. Support for Recruit Lifestyle Co., Ltd. and VeriTrans Inc.'s*1 “AirREGI”*2 mobile payments are scheduled to begin in April. Stores implementing “AirREGI” payment systems will be able to accept payments through barcode scanning. *1: This partnership is made through VeriTrans Inc.'s affiliate member, ECONTEXT Inc.
*2: A separate application is required to make mobile payments with LINE Pay through AirREGI. *Combined total of JCB affiliate locations as of September, 2015: 9.59 million locations in Japan and 20.06 million internationally. LINE Pay Cards offer LINE users a convenient and rewarding way of making everyday purchases online as well as at physical retailers. Users can enjoy 2% rewards (2 Points for every JPY 100 spent) on purchases as LINE Points (explained below). This return rate is comparable to the highest cashback incentives offered by competing credit cards and point cards. Users who have accumulated 1,000 or more Points can convert them into part of their LINE Pay balance. Furthermore, unlike with conventional credit cards, applying for a LINE Pay Card does not involve a credit screening process or any applicant age restrictions. 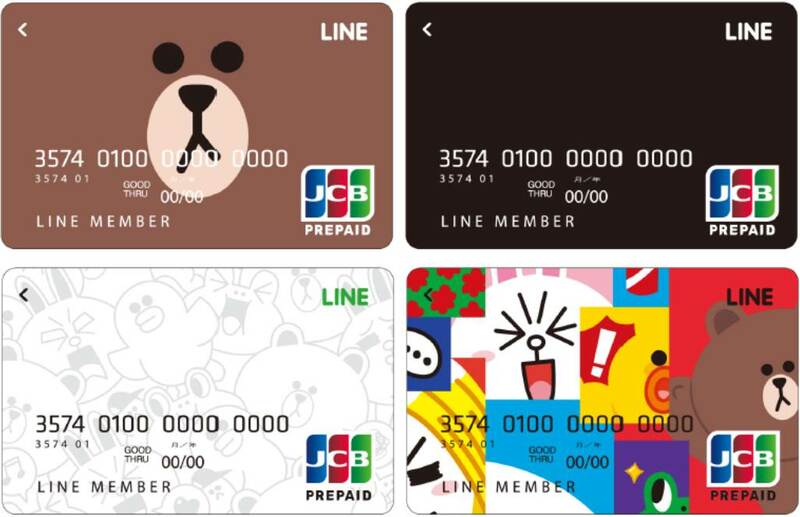 Japan's 68 million LINE users can choose from four unique card designs when they easily apply for a card from the LINE Pay app's home screen. There are no registration or annual fees. Combined with the LINE Pay app, users can conveniently monitor their usage history in real-time on LINE. Point rewards: 2 Points for every JPY 100 spent. Application process: Card is sent by mail within 7 to 10 days after filling out the required fields on the LINE Pay app. Unique features: Users receive push notifications in the LINE app immediately after using the card. Real-time balance management and account activity monitoring is also possible. LINE Pay Cards will become more convenient for use at any of the 12,000 Lawson, Natural Lawson, and Lawson Store 100 stores across Japan. With a planned start in June 2016, users will be able to add money to their LINE Pay Cards from any Lawson register. On March 24, 2016, LINE launched its LINE Points reward program for the LINE platform. Users earn Points when using their LINE Pay Cards on everyday shopping and internet services at a rate of 2 Points for every JPY 100 spent. Furthermore, the existing LINE Free Coins reward program will be incorporated into LINE Points on April 25, 2016, allowing users to also earn LINE Points from within the LINE main app. Accumulated points can be used for LINE STORE and LINE FRIENDS official online store purchases at a rate of 1 Point to JPY 1. Additionally, 1,000 or more Points can convert them into part of their LINE Pay balance to use at affiliate LINE Pay stores, send money to other users, or withdraw money to a designated bank account. Plans for inter-point program conversion tie-ins with other businesses are scheduled for this summer. - From March 24, 2016 forward, payments made with LINE Pay Cards will confer 2 Points for every JPY 100 spent (excluding promotional periods). - Starting April 25, 2016, Points can be earned for viewing LINE advertisements and using LINE services (the former LINE Free Coins program will be incorporated into LINE Points). - Points can be converted to part of the user's LINE Pay balance in possible increments of 1K, 3K, 5K, and 10K Points. - Points can be spent on purchases on LINE STORE and the LINE FRIENDS official online store. - Points can be converted to LINE Coins for purchasing LINE stickers, themes, and other services. LINE intends to further expand the LINE Points service going forward. As one of the central pillars linking LINE's various services, LINE Pay aims to lead the future mobile FinTech industry through its LINE Points service, as well as through continuously innovating its technologies and services for a more convenient, cashless world.